Hola ladies! If dropped temperatures and layers of clothing on your body feels like a very lazy and uninspired future, then hold on till you listen to what we have in store for you today! Okay! Okay, now stop biting your nails out of excitement because in the next 10 minutes, you will have a whole lot of fresh Decent Winter Work Outfits to try Right Now! Yes, look below, and take some inspiration. Start revamping your wardrobe ASAP ladies! Why not opt for a duster overcoat that is of any color in the velvet material? This velvet duster is going to look stylish over any kind of Decent Winter Work Outfits – printed, floral or plain. Choose your sweater color and pattern and pick similar skirts for a decent work outfit. You can choose to wear any matching top over this, because your main highlights will be the matching skirts and sweaters. To keep your feet warm, pair it up with closed shoes. Maybe you would want to try these new and office-approved piercing ideas ’cause winter is the right time to get one. The Blazer coats are the new fashion trend for the sweater days! Pair it up with low hem jeans or any other colored trousers to complete the look. You can wear a plain shirt beneath. Camel coats can never fail in uplifting the style quotient. It has been one of the classiest yet Decent Winter Work Outfits and you can pair it up with all your work outfits. Just choose the right colors. Yes! To keep you warm, this is one of the trendiest work outfit for winters. Just reverse the pattern and wear a full-sleeved plain shirt inside a dress. Do you need a sweater on top? I don’t think so! If you still need a little warmth, pair it up with knitted drapes on the top. 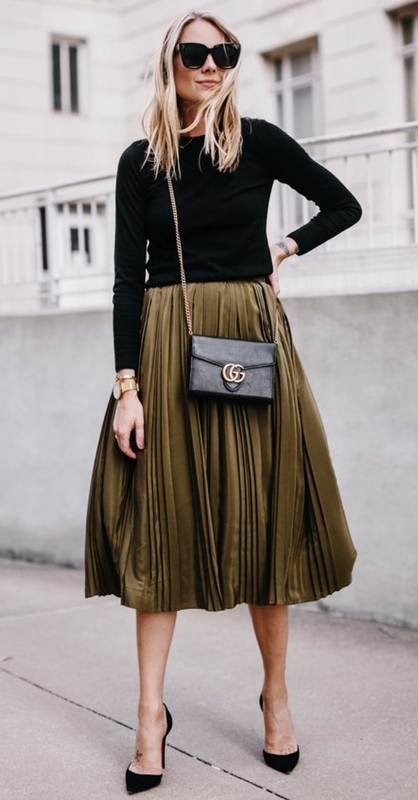 Ditch the old school shirts for work this winter and instead pair up all your trousers and skirts with stylish turtleneck sweaters. Tuck them if you are heading in for a meeting! Floral printed tees, a midi skirt and a leather jacket to complete your Decent Winter Work Outfits look– this is just one work outfit idea with leather jack and midi skirt in the picture. If you do not want to go for printed or striped skirts and want to keep it plain, you can do that by adding a dash of stylish and colorful scarves! Keep it warm in style ladies! Remove the scarf and jacket layered over it and you will have the one most trending summer work outfits. Read here for more summer work fashion inspirations! Knitted skirts are available in plenty today! Grab some cool knit bottoms, pair it up with tights and a matching worktop! 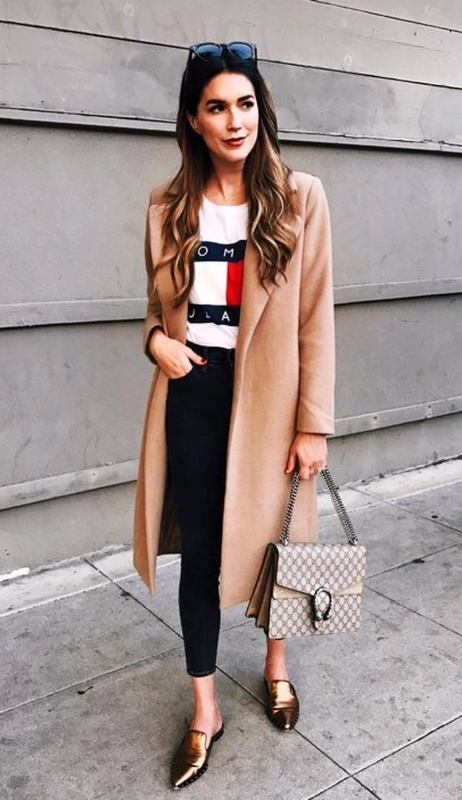 Choose subtle shades of sweatshirts as tops and adding a contrasting color blazer with the classic white or brown bottoms! Boot it up and you are all set! For those weekend ready Fridays, ditch the casual tees, and opt for oversized sweatshirts instead. Team it up with denims. 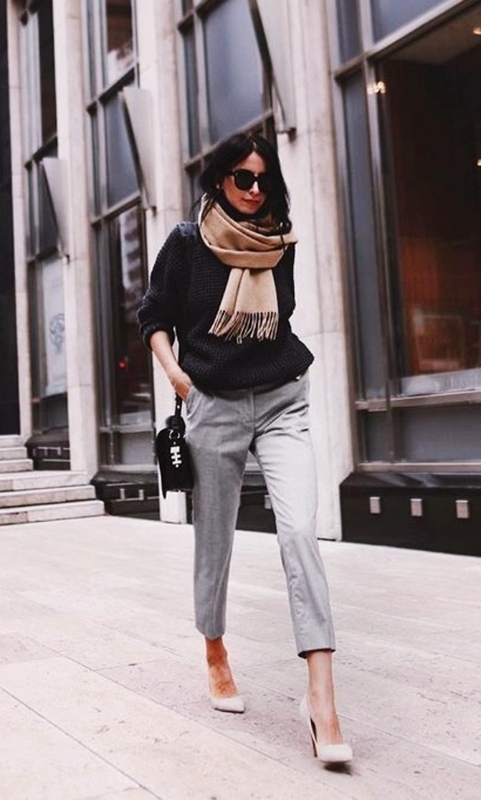 Flared pants spread a little wider than normal trousers and are ideal in winters. Opt for oversized jackets or camel coats over these. You can also opt for leather or velvet jackets to add a dash of extra style. Do we need to say anything else for this Decent Winter Work Outfits? Just ensure you go contrast with this style because that’s when the whole look wills actually glam up. If the temperature has dropped way more than expected and you are looking some more rescue, then drape printed hues on top of your outfit! Time, is flying away at a lightning speed, and keeping this pace in mind, it will fly away so soon, while you are indulged into planning for your Christmas outfits and gifts that you will have ZERO time left to actually transform your work wardrobe for winters!